Learn how to use the distributed version control system git that turns your code into a time machine in which you can track changes, access previous version of your code and collaborate with other team members. 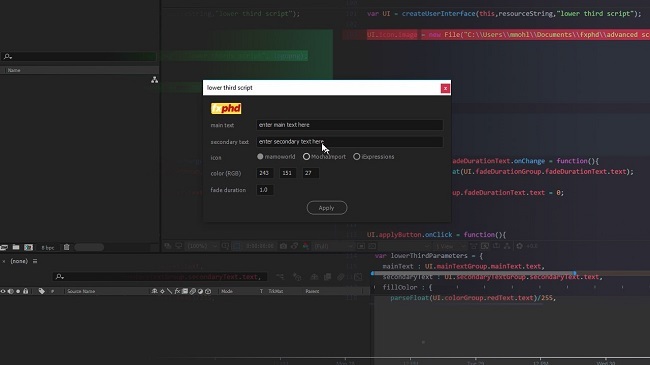 Also, learn how to configure the Atom text editor for After Effects scripting to turn it into a very powerful alternative for ExtendScript Toolkit. The best of it: Both git and Atom are not just highly professional software development tools, but also available free. In this class Mathias explains how to embed binary files – like the images of icon buttons – directly in your code. You also learn how to make your code more modular by using functions effectively. Gulp will help us to automate many tasks of script development. In the previous course AFX303 we have seen that it makes a lot of sense to develop modular code that is distributed over many source files. But when we deliver the project to a client, he usually want to have a single, self-contained script file that often should also be obfuscated to protect our intellectual property. Gulp can do all of this an much more fully automatically. In the course AFX303 you learned already the basics of using the git version control system. Now you learn how to use it when working with several people on the same project in parallel. For this, you learn how to work with different branches, how to deal with merge conflicts and how to synchronize your project with a server that can be accessed by all team members. You learn how to start the After Effects render queue or Adobe Media Encoder directly from a script. We cover all the details of controlling the render settings and output modules. As an example, we write a script that renders different variants of a lower thirds project based on data stored in a spreadsheet file. Similar to a watch folder, the script can even monitor the spreadsheet and as soon as the content of the spreadsheet changes, the script starts rendering the new content fully automatically. While focusing on those three topics, you will also hone your skills to write clean and modular code. With gulp, for example, we also configure a linter that permanently checks your code quality in the background. And in our scripting code for the render queue, for example, we exercise how to minimize redundancy in the code by using functions as arguments of other functions. Learn the basics of gulp, in particular how to install it and how to use it to automatically combine all source files of a script into a single result file. We add a lot of extra functionality to our automated gulp build system. In particular, we learn how to obfuscate and zip the result file, how to add a meaningful header with version information and how to implement a clean task. All about linting. You learn how to work with the linter JSHint and how to configure it properly to deal with the special needs of After Effects ExtendScript. Time for some team work! In this class, we setup a central code repository using the web service of bitbucket.org. We use it to share our code among several team members such that the code we write during the next classes can be developed by several people in parallel. You’ve learned a lot about gulp already. But today, we are not just using it to build your scripting project, but to setup an automated Ae workflow: We configure gulp such that it monitors a spreadsheet file in the background and as soon as the spreadsheet file changes, it automatically renders the jobs described in the spreadsheet file. In this class, you do not just get a new perspective on gulp, but also learn the basics of scripting the render queue of After Effects. We take an in depth look at rendering. You learn how a script can apply presets for render settings and output modules, adjust individual settings and send render jobs to Adobe Media Encoder. We focus on your skill to write clean and modular code. 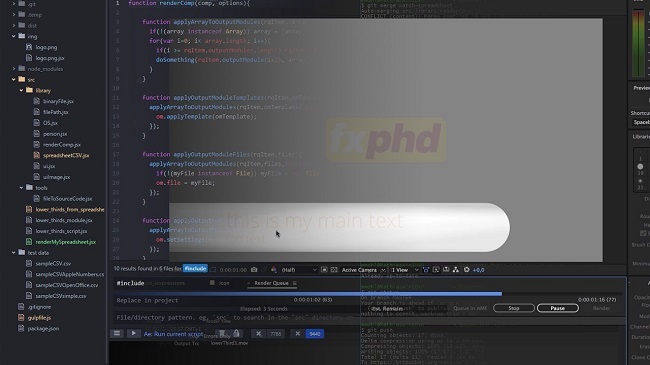 We wrap all the knowledge you gained in the previous class into a convenient and intuitive function that will become your swiss army knife for scripting the render queue. To avoid repetitive parts in our code, we use advanced concepts like passing functions as argument of other functions. Finally, it is time to bring everything together. First we finish our rendering function and then we merge the code of all team members into the final result. To do this you learn how to merge code with git and resolve merge conflicts when several team members modified the same part of the code in parallel. The end result is a fully automatic pipeline to render lower thirds. The content of the lower thirds is stored in a spreadsheet file that is monitored by our pipeline. As soon as the content of the spreadsheet changes on disk, a template project for the tower thirds is opened in After Effects. Then for each lower third contained in the spreadsheet, the content of the template project is updated and rendered immediately.